The weather over the last few days has been wonderful. It has been as warm as a day in the middle of summer. Ram wasn't at work today, so we were able to spend a family day outdoors. First we turned our attention to the vegetable patch. We were lucky enough to move into a house with a ready made vegetable garden at the back of the garage, complete with a large raised bed and some good soil ready for planting. We gave it a good dig over and then we planted a few things - carrots, spinach and spring onions for now. I've got a few other things started inside in the propagator. Maybe this will be the year that we finally manage some proper vegetable gardening! We had our lunch outside. Mia has been a bit under the weather lately, so hopefully some fresh air will have done her good. After lunch I helped Harry to make a fairy garden in a large plant pot saucer. We used a smaller saucer to make a little pond and then decorated it with small stones, plants and flowers. We've been having a few sleep related issues lately (by lately I mean for the last three years or so...) so we have promised him that if he is good at night tonight then the sleep fairy will bring him a present. The fairies in the garden are some stickers that I already had stuck onto cocktail sticks. He was really interested in this activity, he loved hunting around the garden for different things to use to decorate it. It has been such a lovely day that we have spent almost the whole day outside. Harry has been running around with his lawnmower, playing in his sandpit, washing his toys, playing football and riding on his scooter to the park. It's amazing the difference that some good weather makes to the things that you can do! I used to love making minature gardens when I was little! I probably got the idea to make one from you! Thank you! Unfortunately it didn't make a huge amount of difference at bedtime, although he didn't get up during the night for the first time in about a week, so maybe something went in! 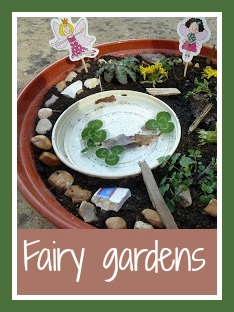 Love the idea of a veggie patch and the fairy garden is sooo sweet! I might get into gear this year and sort out a veggie patch of my own! Thank you! Every year I'm full of good intentions but they don't always last, but each year I do manage better than the year before! I've linked this one up as well. Hope you don't mind!